How Do You Pray For Forgiveness? 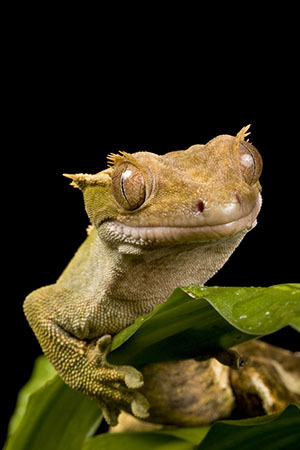 You may think that geckos are merely cute, little lizards that occasionally appear in car insurance but the truth is, these remarkable reptiles are loaded with design. In a way, they are like miniature superheroes that can take out pests, escape danger, and walk up walls. Many species of geckos also have an amazing escape maneuver when caught by the tail by predators. Geckos don’t play dead or become invisible; they actually self-amputate their tails. If a predator catches a gecko by the tail, the lizard contracts its tail muscles in such a way that a tail bone (called a vertebra) breaks. Thus, the gecko is able to get away, while the predator is left holding the detached part of the tail. Amazingly, over the next few months the gecko grows a new tail, complete with tough tissue, muscles, and scales. Imagine if cars could regenerate themselves after accidents. What if cell phones could automatically restore themselves after being smashed? If an engineer could design machines with gecko-like regenerating abilities, he would be hailed as a genius. No one would ever assume that a car or phone with such abilities could be the product of evolution; it would have to be designed. 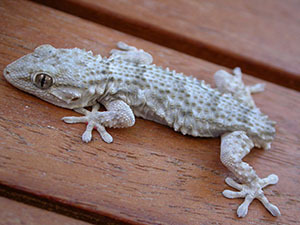 Similarly, the gecko’s self-amputating, regenerating abilities must have been designed by a grand Designer. Perhaps even more incredible is the gecko’s ability to walk up vertical walls and across ceilings without the use of man-made suction cups or sticky liquids. A gecko has five toes on each of its four feet that can point in almost any direction. On each toe are thousands of hair-like structures called setae (SEE-tee). At the end of each seta are tiny structures that scientists call spatulas. Why? Because they look like spatulas. According to scientists, these tiny spatulas are perfectly suited to allow geckos to stick to nearly any surface. 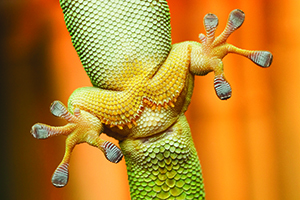 Scientists are so amazed by the gecko’s “sticky” ability that they have set out to copy it. In recent years, scientists have closely examined the gecko’s setae and spatulas and have developed tiny man-made tubes (called nanotubes) that mimic the real, biological wonders. From these artificial nanotubes scientists have produced small strips of tape that can be reused dozens of times. Still, as good as these man-made strips of tape are, scientists admit that they are nowhere near as good as the real thing. As one evolutionary scientist put it: “[G]eckos have…one of the most versatile and effective adhesives known” to man. Why are they so versatile and effective? Why is the gecko such an amazing animal? Because “the everlasting God, the LORD, the Creator of the ends of the earth” (Isaiah 40:28) was the mastermind behind this creature.